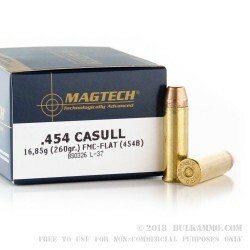 This 454 Casull cartridge by Magtech offers a 260 grain full metal case, flat nose projectile. 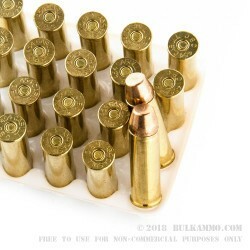 If the designation “full metal case” seems unfamiliar to you, its function shouldn’t -- this bullet type is for all intents and purposes the same as a full metal jacket. 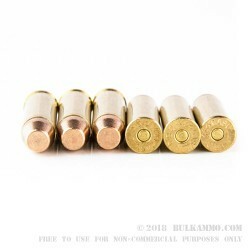 That means you can count on this bullet’s copper jacket to spare your bore from undue lead fouling, letting you shoot for longer in between cleanings without watching your accuracy decline as the result. 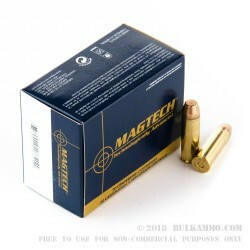 This bullet’s flat nose makes it perfect for target and competitive shooting, during which it will create clear and easily scored holes in a paper target. This round is content to sit around for a very long time owing to its non-corrosive Boxer primer, which along with its brass casing makes it perfect for handloading. Magtech’s state of the art production technology and thorough quality assurance program are demonstrated full-force in this round, so it’s certain to satisfy.